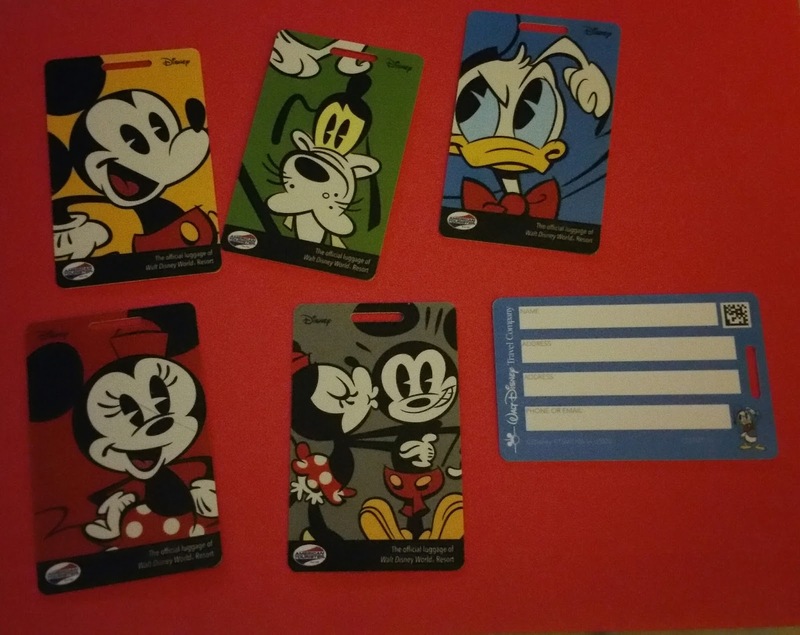 Travel Time : The latest and coolest Tech tools for practical guest use at Walt Disney World, current as of October 2015: My Disney Experience, Text room assigment notifications and more! 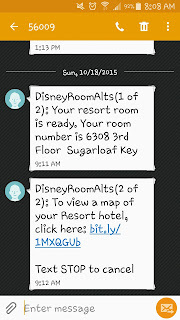 The latest and coolest Tech tools for practical guest use at Walt Disney World, current as of October 2015: My Disney Experience, Text room assigment notifications and more! Disney has the coolest concepts when it comes to rides, shows, resorts, food...basically everything. This is a quick update on the latest cool stuff it has unleashed to make the guest on property resort experience as easy and fun as possible. First, the website. I'm not going to stretch the truth and say it is good. It is not. It is amazing to me that Disney is so brilliant in countless other ways, and yet when it comes to website building and traffic, there is much to be desired. It crashes, it times out, Stitch eats a lot of pages. Just embrace that fact...their website is not good. Having said that, the concept of My Disney Experience is indicative of the brilliance Disney typically applies to everything. The App could also be a bit easier to navigate, but whether you are online, using the App or both, it is a fun addition to planning your vacation. If you are working with a travel agent, the two of you can work in conjunction. If you have any Disney account log in online for any of their websites, you already have a log in for www.disneyworld.com. If not, creating one is easy. Then you get to play! You can create profiles for your family members, change their character pictures to represent their unique personalities, and build a wish list. Under reservations, you'll be able to see a quick snapshot of your reservation, including dates, resorts, and package type. You'll also eventually see Dining, Tickets and Fast pass reservations as they are added. That is the at a glance page where every reservation is in one place. For each day of your trip, events, parks, and notes for the day can be added. Reservations will automatically update in each day as they are made. The one thing I wish is that Disney had an at a glance page with all of those things and not just for physical reservations. And keep in mind, children's activities, Spa reservations, and a couple of restaurants will not currently show, so you have to physically add them to your itinerary. In your profile, a credit card can and should be stored. This will make scheduling dining reservations quick and easy, for you or your travel agent. Most can be made online or through the app. A new addition has been added...you can copy your current Fast Passes to another member of your party. As long as the system has availability to match, it will, making it easy to choose for additional people if they choose to join you later. Magic Bands can be designed and ordered through MDE. Make sure the shipping address is set as yours! If you have multiple Magic Bands and they are all registered under you, they will all work interchangeably. If you bring three on your trip, all three will have your reservations and unlock your room door. It is quite amazing. TIP! 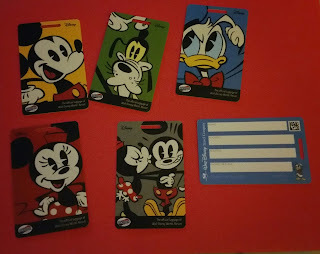 If you have a package (not a room only) and you receive Magic Bands, then don't forget to lift up the bands and look underneath, your new luggage tags are there! Online check in should be completed. Only one credit card can be stored in MDE, so if you want to use a different one, you'll have to physically enter the information. You also choose a pin for each person. My pins didn't seem to work correctly and we did have to go to the front desk to have them fix it, but basically when you make a purchase at any store or restaurant, you scan your Magic Band and enter your pin. Here is where it gets extra fun. If you complete online check in, then on your arrival day unless you check in super early you'll get an email and a text with your resort room number. Basically when you arrive at your resort, you can skip check in entirely and proceed directly to your room. 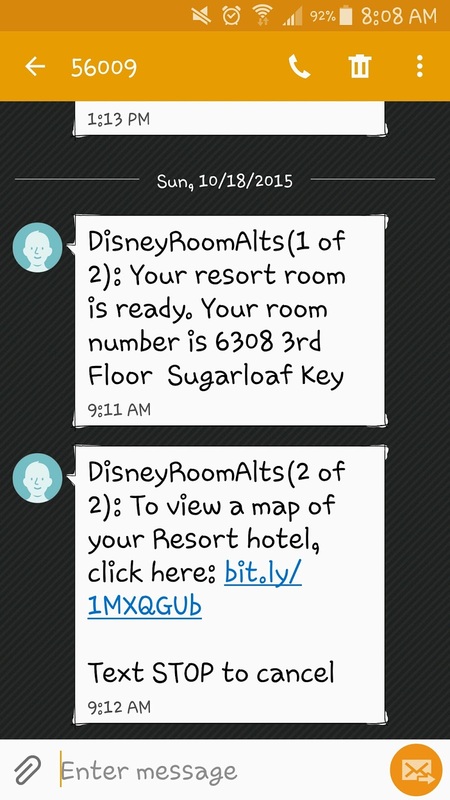 The info will even include a link to the resort map, so you can see where to go. My first text thrilled me...how innovative! And how awesome, I know ahead of time if I like my location or if I have to do a little sweet talking once I arrive. And it WORKS. Your Magic Band will pop open your room door like, well, magic...with you having done no standing or waiting or checking in. Unbelievable! We stayed at two different resorts during my recent visit and both times it was thrilling to get those texts and emails. If you check in before your room is ready, then you'll get one with your room number once it is ready. Extra awesome, Disney! All of the little tricks and tools can be a bit overwhelming, but these are the most helpful and newest tools for guest use to make maximizing your vacation a top priority. The smoother it is, the more likely it is that you will visit again! CINDERELLA'S ROYAL TABLE YES OR NO? !